Fantastic. Using my silver LZ CLS s x h as my SKCM Blue board myself. How do they sound in there? I find my blues sound quite poor in aluminium customs, but I only have them in 60% trays and have done very little to help them as I lost most of my interest in Alps. The only plate material available for the GB was SS, but imo, they feel and sound perfect. But I also use MX most of the time. Alps is fun though. The king of all Cherry boards. Why Cherry is not making these any more... what a pity. My "newest" acquisition, as described in the "Stuff you just bought" thread. 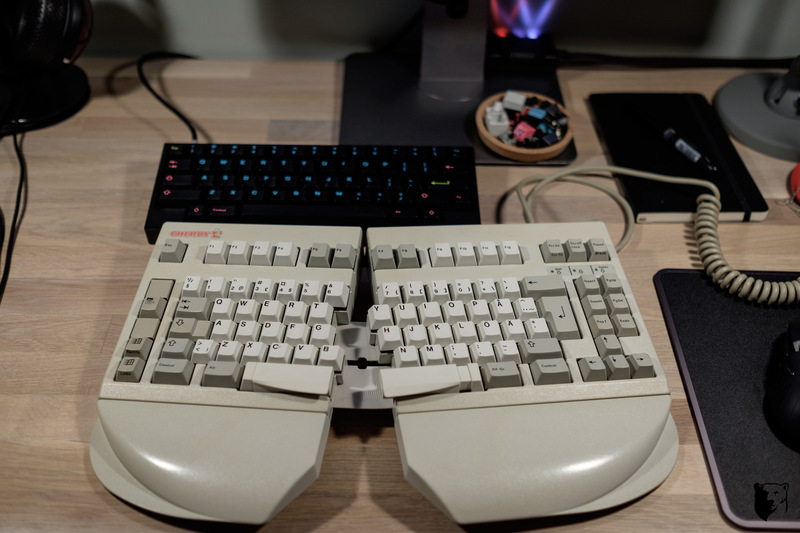 A regular Model M turned into an M104 (converted from ANSI to ISO, and the numpad made into a 19-key cluster). APL keycaps from an M122 that I got on eBay; blanks on the numpad that will later be subject to artisan lettering. Got some great condition Blue Alps at last on this OEMMAX/ORTEK MAC105 keyboard. Worth making a header off of ? So I recently bought a couple sets of Alcatel MMK keycaps; both have the Portuguese layout. These keycap sets use a mix of double shots and pad printing; I decided to shoot a picture of both of them, with one set facing up and the other facing down. Enjoy the photato! Alcatel MMK keycap sets (Portuguese layout). Here's my first new caps in a long time: KBDfans Topre set. In Cherry and Japanese styles. As pure coincidence would have it, a whole new set of caps just showed up out of the (Italian…) blue today! Fantastic set! Pretty sure I've put on on all wrong! 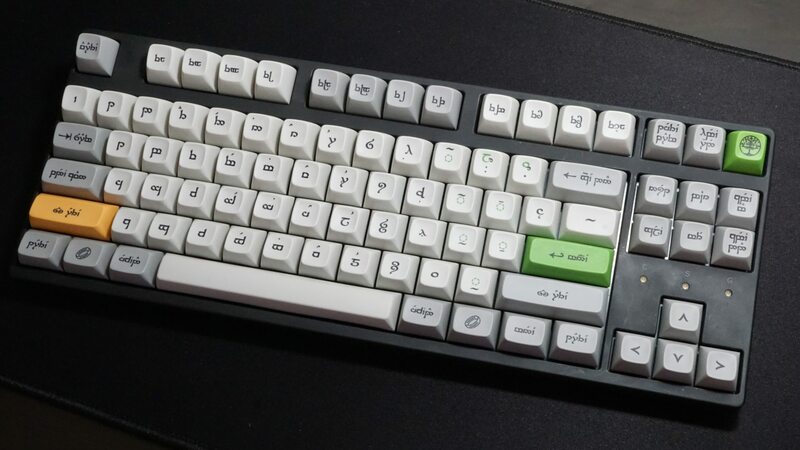 Anyone got the official dev/tty Elven key chart? Now, there are a few oddities: my Left Shift is, I'm assured by the robot himself, the only yellow one of this set in the world. (It's the prototype I think.) I've got a nice green ISO Return but no ISO Left Shift. (Do have the HHKB layout version, though, he knows me well!) And you may have noticed I'm missing a spacebar! But man, these caps have character and I'm delighted we meet at last! The heavy DOF makes it real hard to see and appreciate those Sindarin keycaps. It looks like the up and down arrows are switched. Correct, and corrected. I bunged them on first before I had the row profile subtleties worked out. That's actually quite a nice shot. A good example of how the right light makes all the difference. This arrangement seems to be sorted just by the looks of the characters though - without any "deeper meaning", or can someone tell more about the thoughts behind this? I believe the keycap assignments correspond to one of the Sindarin fonts out there. Yes, sure, but if I would have done it, I might have taken a Sindarin character, that stands for a sound like "s" and would have put it in the normal position of the "S" key and so on. It could probably not be done for every key perfectly, but I would do it where possible. I get AJM's point. Here's the thing, though, see those Hiragana caps on my Realforce? They don't correspond to the sounds of QWERTY's letters either. If I was designing Japan's keyboards, I'd have taken AJM's approach as well. But things don't always work out that way. Now, Sindarin is a complex beast. Glancing at Wikipedia, I know I don't understand it. But is its writing system a syllabary like Japanese (in Hiragana and Katakana)? I like those—I may even have one of my own in the early stages—but I think they all rather break any hope of 1:1 compatibility with alphabet representations, as we're so used to on our keyboards. Syllabaries are more about grids. Indeed, they're more attuned to matrix layouts and Tipro! that wouldn't be possible. First because there are not enough letters for the sindarin sounds, secondly because each language has different sounds. I used a standard for typing Sindaring, this way it's not just a fancy otaku set, but it's also a functional set. If you really want to write in sindarin, now you can. If some Sindarin experts have designed that layout, I'm already quite happy. Should you have any links to more detailed information about how that was thought out, I would be very interested and grateful.